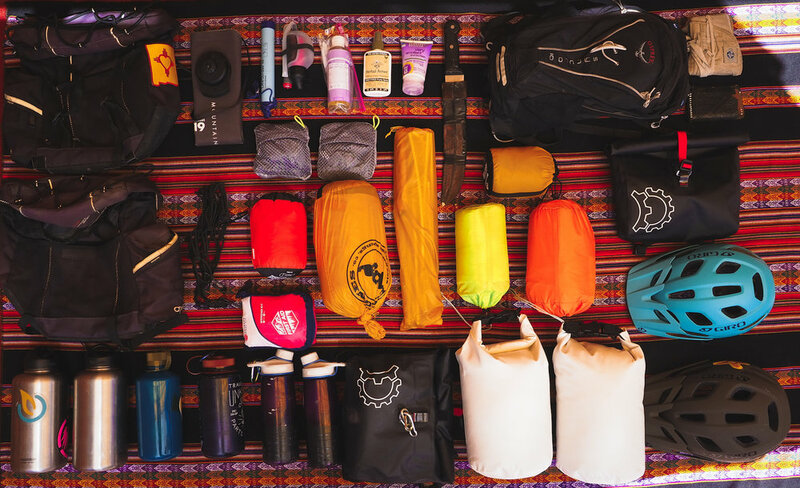 Gear List: Everything You Need for a Year of Bikepacking in South America — Let's Go Cariño! has been one big lesson in adaptability. We are always learning how to shed weight, re-configure our set-ups, and re-prioritizing gear. What we've learned is that a delicate balance exists between hauling the stuff you really need vs. the stuff that you could live without, but don’t want to (enter Peruvian charango guitar). Music at camp after a long day in the saddle? Worth it. We learned a lot after spending 14 months living on our bicycles in 2016-2017. How to travel light. How to live with less. How to let go the stuff you accidentally left behind. At the start of our last trip, we made the classic newbie bicycle touring mistake of starting out with way more than we needed, including lots of things we could pick up easily along the way. We may have had to learn these things the hard way, but we learned them no less. 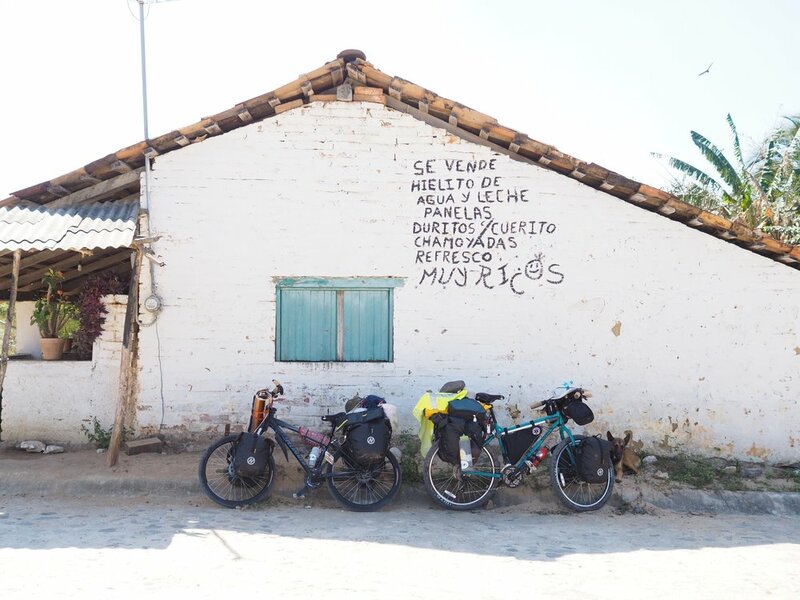 We also discovered after many miles on hot pavement in Mexico that we much preferred riding dirt roads through the countryside, so we slowly evolved from traditional bicycle touring set-ups (with panniers and thinner tires) to a lightweight bikepacking set-ups (with bikepacking bags and fatter tires). This allowed us to really explore the quieter, back dirt roads that we’ve come to know and love all over Latin America. Our bikes at the very beginning of our adventures through Latin America. Mexico, February 2016. Everything you need to travel on your bicycle for one year. Long-distance bikepacking for the first time? Ask yourself: What can’t I live without? Good sleep, a reliable shelter, good layers, water, and food reign supreme. Our new Big Agnes UL2 ultralight tent is 2.3 lbs, down from our old 4.5lb NorthFace tent. This is an awesome, small and lightweight tent. We really love it. It is perfect for backpacking and shorter bikepacking trips (<1 month). However, now that we are a couple months into using it, we do wish that we had gotten the three person tent (UL3) instead, as there is not much extra room to spread out once our sleeping pads are blown up. For such a long trip, we would have been happy to carry the extra 7 ounces for more space. We use inflatable sleeping pads as we have found them to be the most insulating, comfortable + lightweight. We are very diligent every day about clearing our campsites and ridding the area of sharp rocks, spines or shrubbery. They come with a small patch/repair kit in the event that they are punctured. Getting a good night's sleep on the road is not to be taken for granted. Invest in a comfortable sleeping pad! Another place we wouldn't skimp on quality is bringing along a good sleeping bag, especially in higher elevations/colder climates. If you’re traveling in the tropics, you will want to carry just a sleeping sheet. If you're cycling in hotter climates, these are not necessary. But we are pedaling and sleeping in freezing temperatures in the Andes, so we like bag liners – they keep our bags cleaner and add extra warmth and coziness to our sleeping bags. It is great to have a clean, soft surface to lay on, or eat on when taking breaks, for cooking on, or for added protection for our inflatable sleeping pads on the floor of the tent if we are camping somewhere rocky or prickly. Honestly, this blanket is used every single day, and usually multiple times a day. Sometimes when Erin gets really cold she ties it on like a cape. One of our most utilized pieces of gear on this list! 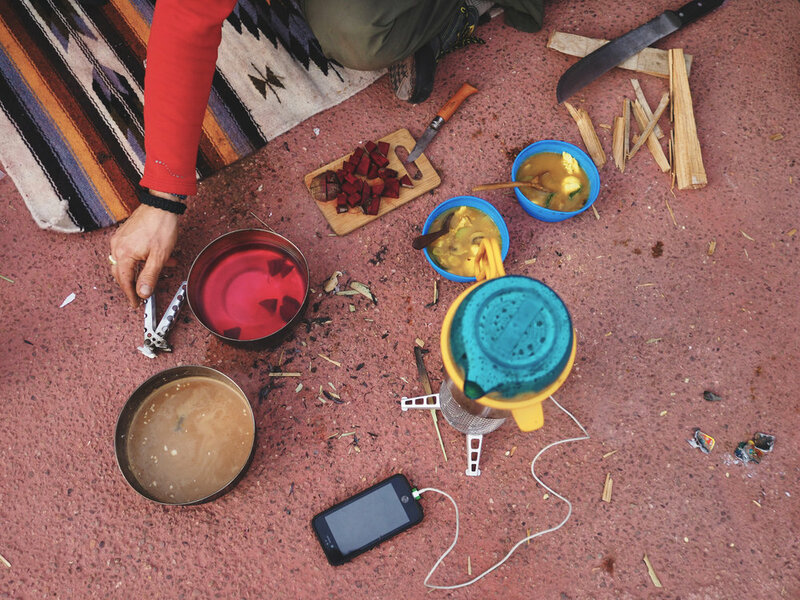 BioLite told us we have probably used the CampStove more than anyone else, which makes us feel pretty proud. We live and swear by their stove. We cooked with the first CampStove over 14 months on our last trip and loved it! BioLite sent over the new version, the CampStove 2, which is even more efficient. This stove has a much larger surface burn area providing a faster boil time than most conventional camp stoves... which means dinner is ready in about half the time. No need to carry or fuss with dirty fuel — we burn any dry bio mass from our camp sites while leaving no trace behind… and charging up our phones as we cook. We had no problems burning bio fuel, even when we were cycling through the rainy season in Central America and Ecuador! What can we say? We’ve traveled with a couple of different cooksets over the years. We find that a single 1400ml pot is enough for the both of us. These are awesome and have lasted us since we started bikepacking in Mexico. We love drinking hot cocoa, coffee + tea in colder climates. We'll brew it up in the morning before we leave camp and enjoy our hot beverages throughout the cycling day. Not 100% necessary, but we love them and think they are worth the extra weight. On dry stretches without a lot of water or food, they carry an extra 12 ounces each of water or dried goods such as oatmeal or quinoa. Some luxuries are worth the extra few ounces. This is one of them! Plus, finding fresh roasted whole beans is a fun game to play when we get to bigger cities. Paprika, garlic powder, turmeric, cumin, pepper, salt and dried oregano are a few of our 'savory' staples. Cinnamon, maca, moringa, chia, flax seeds and shredded coconut fill out our 'sweet' spice bag, which we use to fortify our oatmeal in the morning. We carry enough food to make it to the next place where we'll find a small tienda or market to resupply, plus a few extra meals in case of an emergency. We carry dry staples such as oatmeal, quinoa, rice or lentils, and sometimes a bag of pasta. We also carry tea, coffee, cocoa, honey and olive oil. Nuts, seeds and dried fruit comprise our lunches and snacks, and also go into our oatmeal. Root vegetables such as carrots, beets and potatoes, plus limes & peppers travel best and can last for several days on the bikes. Tomatoes, avocados and whatever fruit we can find are also in the mix. We love bananas but they are very difficult to travel with – apples, oranges and pomegranates travel much better. Fresh herbs like cilantro, basil and parsley are great, but only travel well in colder temperatures. Going off the grid requires us to have electricity for navigation purposes. Between our Solar Panels and our PowerLight Minis (see below), we are able to stay off the grid for as long as we need to, with renewable energy at our fingertips. Multi-use gear is really where it's at and BioLite always delivers in this department. These are multi-use camp/bike/cooking lights and can be used as power banks in case we run out of battery on our smartphones… which happens regularly. They have come in handy more times than we can count. This is a little heavy but worth the extra weight to have a super capable machine for video editing and working on the road. If you are cycling as a duo, and both want to carry cameras, we can't recommend this enough! Being able to swap batteries and lenses is the most bang for your buck. Tubeless patch kit, regular patch kit, Gorilla tape, needle + floss, Tenacious tape, chain link repair, chain lube, zip-ties, spare tubes.